Lately I’ve been getting emails from John Wick. At first I thought they were related to the Haiti bundle, I’ve gotten loads of mails about random gaming products since I purchased that one. But the emails got more insistent asking for help naming NPCs and stuff, the plot thickened. 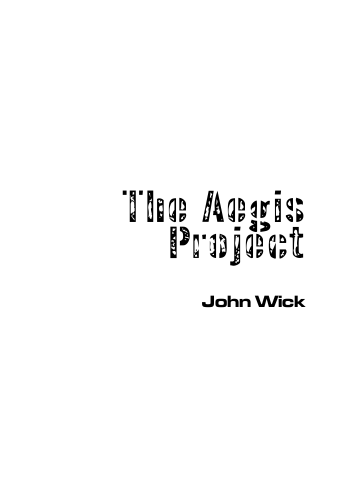 A few days ago the answer to the mystery of the strange emails revealed itself in the form of yet another email – this time with a download link to John’s latest game, The Aegis Project, which I had apparently sponsored and then promptly forgotten all about. The game is 177 pages. Single column text in a very readable layout makes it a nice read, the first read through took me about two hours. There’s b/w interior art by Mauro Mussi, mostly showing mechs and posing people. I caught a few typos in the text, and a few rules that could have been more clearly written, but the total impression is still solid. The setting in The Aegis Project is realistic sci-fi, or at least plausible to some extent. Mankind has reached the stars through FTL travel and established hundreds of colonies. One day aliens attack by sending an army of robots. The game is about the soldiers that face that threat, the soldiers can have access to mecha. There’s also two more settings in the game that pick up the ball and proceed with a civil war a few hundred years later, and even later another war with another inhuman enemy. The rules cover template based character generation, task resolution (where you roll for narration privileges rather than success), and a rather abstract and narrative combat system. The main feature of the game, The Camaraderie mechanic which constitutes of a shared pool of bonus dice that any player can take from, and contribute to, arbitrarily. There’s neat stuff happening in at the table as players interact with the pool, even abusing or abstaining from using it tells the other players something about the character. The game includes a brilliant method of adventure design, the GM states the overall goal of the adventure. Then the players take turns adding a few complications and intel before the adventure as such starts. No prep for the GM, and still a rather traditional form of adventuring in actual play! The game uses the traditional GM+players setup, but some interesting things happen in char gen. A player can chose to play a whole squad of soldiers instead of a single PC. A brilliant move to flesh out a squad of PCs without resorting to NPCs. Players roll for narrative privileges in non combat situations, but in combat it reverts to the traditional pass/fail interpretation of dice rolls. This gives the game breadth of styles, covering both the traditional way of the GM interpreting the die results to produce a sense of chaos in combat, and a more story gaming kind of play in non combat situations. The setting is ok, it tells us a lot on the grand scale, but little about the details. Expect to fill in a lot of blanks when playing. The rules are good, they cover the needed ground and the Camaraderie mechanic puts some mechanical focus on playing a group of soldiers. The form is very good, clear explanations of how the game should be played, including a few short bits of examples from play. There is also a bit on how to tie the three settings into a long continuous campaign of over 15 sessions. There is enthusiasm in the text, and right after I had read it I was ready to start a game right away. But after some deliberation I’m not certain. I want to see the game in actual play, and I’d rather run than be a player. But I think it might be a bit too focused on the soldiering at the expense of lack of coverage for what happens out of the combat zone for my tastes. I find it more interesting (although not as pretty as) CthulhuTech, a somewhat similar in scope and idea. But that game also put a very strong focus on the fighty bits, ignoring the rich “civilian” setting it sported in the background material. There is nothing in the game about the space travel, people do their fighting in the mud on far away worlds. There is definitely room for a supplement here, something along the lines of a Wing Commander RPG. 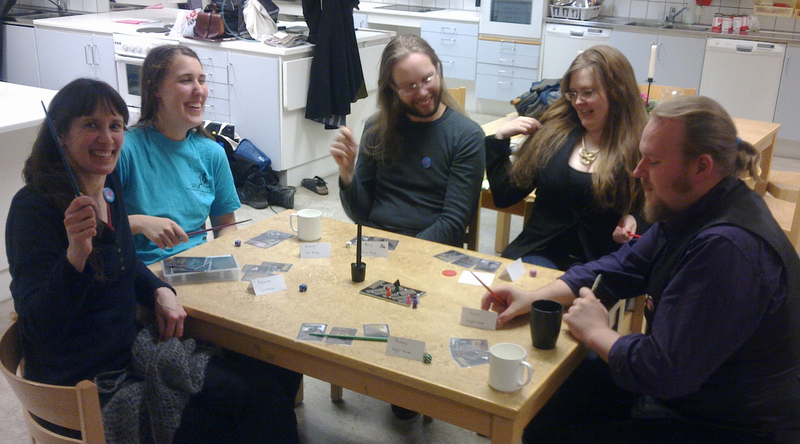 Last weekend I went with some friends to SävCon XI to host the Indie Gaming Lounge for the third time. After the signups there were just three registered teams/groups who had shown an interest in our event, but when we did the final count we had run no less than 26 games. Some GMs from the other events had to cancel at the last minute and their players were sent our way, then there were the usual drop in players, and a few games where the free hosts of the IGL sat down to play a game for themselves. I ran six games, went to the sauna, had the traditional IGL sausage Stroganoff supper, dodged the TV team and had a good time in general hanging out with the other hosts of the IGL. We have been thinking of retiring Zombie Cinema from the IGL, after all – the event is about demoing new cool games. But still we bring it with us every year. It’s an awesome game, it’s easy to teach, and pretty much everyone has some form of prior knowledge of the ‘setting’. At one time, when we were choked with players we just handed a group ZC and told them to have fun. They came back four hours later with the game, cheering and laughing, they’d had a blast. So I think we’ll have to keep it on the menu for another few years. It’s also a good game for new hosts to run, since it’s so easy. The game I played was set at a wizard school, somewhere halfway between Hogwarts and Brakebills College. It was great fun and reminded me to get back to writing The Academy. I ran a game of The Daughters of Verona. Two of the players were SCA enthusiasts and one was a student of theater and script writing. That definitely was no disadvantage in having a good time with the game, but it was nice to see that enthusiasts of the genre could enjoy the game as well. One of the players even posted a short AP after the game. Right before packing up I ran a quick game of Witch Quest. Since there were an odd number of players I let one of the witches have twin cats who shared all pools. It worked very well, and I’ll keep that technique in mind for future games.